While September was a month of travelling, October was spent in Boston and I’m so happy about it because there is just something about fall in Massachusetts. The colors, the weather, the fun fall activities… it’s the best! I love when friends or family come to visit Boston and I get the opportunity to show them around town. Last weekend my mom was in town and we had a great mother-daughter weekend. 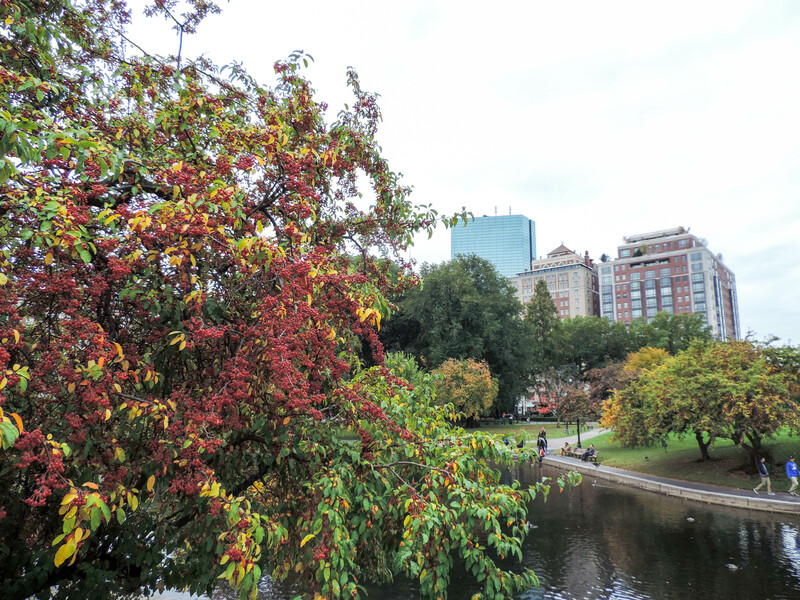 We took in the Public Garden in its’ fall glory and also visited the Isabella Stewart Gardner museum. If you haven’t been yet, you must take a visit! The courtyard is beautiful right now for fall, but I think it’s great any time of year. I’m ready for Halloweekend, but we’re having a pretty low key one this year. I’m kicking off the day with a 5k in support of Big Brothers Big Sisters and we will be ending it trick or treating with our adorable niece and nephew. How are you spending your Halloween weekend? What I’m listening to: If you aren’t listening to Adele’s Hello on repeat, I don’t think we can be friends. Just kidding… kind of. I can’t wait for her new album! October has also had the most perfect weather for running and I’m loving the addition of Demi Lovato’s Confident and Ellie Goulding’s On My Mind to my running playlist. I’ll definitely be jamming to both of them during this morning’s 5k. What I’m making: All about the fall comfort food right now. I loved Burpees to Bubbly’s Stuffed Acorn Squash– I substituted apple chicken sausage in it, it was amazing! From my own blog archives, Crock Pot Turkey Chili has made a comeback for football Sundays in our house. What I’m loving: This list of most Instagrammed places in Boston– have you visited them all? Candy corn, especially this recipe where I’ve baked them into soft cookies! World Market– they opened their first store in Massachusetts earlier this month and it was so fun to check it out a the opening and I’ve been back since for their cute home décor items and awesome wine selection! What I’m looking forward to in November: A relaxing weekend away in Vermont with MJD. My bestie’s wedding in Philly- can’t wait to stand by her side on the big day. Continuing to overdose on anything pumpkin flavored. What are you looking forward to in November? thanks for linking to my recipe! Love your outfit in your post today! Thank you for the delish recipe! Too funny you commented because I made it again tonight 🙂 Kind of obsessed! Thanks for visiting my blog, girl! Thanks Andrea- it’s beautiful this time of year! You won’t be jealous once the snow comes though 🙂 I’m too obsessed with Adele- can’t wait for the album!